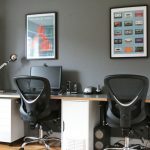 In a previous post (HERE), I told you about my love of the movies and shared some of my favourite movie moments and talked about the memories they evoke. Like movies, music stirs up so many memories for me, too. Lately, they’ve come flooding back as I’ve rediscovered some of my favourite songs whilst listening to the radio in my car. I overruled my daughters’ preference for Kiss FM, and have enjoyed some of the classics with my own choice of station, Heart 80s! Listening to these ‘blasts from the past’ reminds me of the time I first heard them. In a moment, I’m transported back to my teenage years, where I’m lying on my bed flicking through Smash Hits magazine as my record player blasts out the 12-inch version of China in your hand by T’Pau. My car journeys and home life have been transformed since discovering Heart 80’s. Instead of my girls singing every word of the latest Justin Bieber tune, it’s me and Cyndi Lauper blasting out ‘Girls just wanna have fun’ at the top of our voices! So what are the songs that roll back the years for me? 1. Eternal Flame – The Bangles. I absolutely loved this song. I had the vinyl single. Mum bought it for me, but it wasn’t a straight forward purchase because she asked for ‘that new song by The Bracelets.’ Muuuuuummmmmm! I’m amazed I didn’t wear out the grooves on that record (or my vocal chords). I played it over and over and over again, listening to Susannah Hoff’s fantastic voice soar higher and higher. 2. 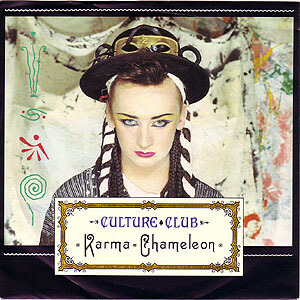 Karma Chameleon – Culture Club. Karma Chameleon was the first single I ever bought for myself. It’s funny how some bloke dressed like a crazed Geisha, with make-up troweled onto his face didn’t seem in the least bit odd in the 1980’s! And what does that song even mean? Who cares, I loved it back then! 3. Take on me. A-Ha. Remember A-Ha Or should I say ‘Ahhhhhh’? I was in love with Morten Harkett, the handsome Norwegian lead singer with his beautifully chiselled cheekbones. ‘Take on me’, with its catchy synthesiser tune was one of my faves as a teenager. At the time, the music video for the song was considered ‘ground-breaking’. I remember being fascinated watching a pencil sketch version of Morten fell in love with a real girl as he sang a nonsensical love song to her. ‘Take on me, take me on’? What does that even mean??!! 4. China in your hand. T’Pau. Don’t you just love Carol Decker?! 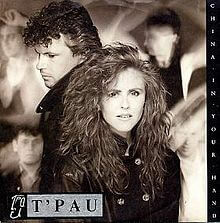 T’Pau were the first band I ever saw live. I drove all the way to Leeds (University!) to see them play. This song was so epic and so different with its orchestral strings plucking away and the literary lyrics about Frankenstein’s monster or some such thing! It was number one for a million years! Don’t push too far your dreams are china in your hand. – Carol Decker, philosopher and lead singer of T’Pau. When I was a teenager, you were either Team ‘Wham!’ or Team ‘Duran Duran.’ I was firmly in the Wham! camp, not being a fan of Simon Le Bon’s angst-laden, whining voice (Sorry, Simon). Wham! Make it Big was the first LP I bought and this song, from their first album, ‘Wham! Fantastic’, was one that stuck in my mind. The lyrics confused me, though, ‘Club Tropicana drinks are free. Fun and sunshine, there’s enough for everyone. All that’s missing is the sea…’ Except, the sea wasn’t missing at all! You could distinctly hear the waves crashing on the shore in the background!!! Ah, memories! There are many, many more songs that provided the soundtrack for my youth, but that’s for another post. 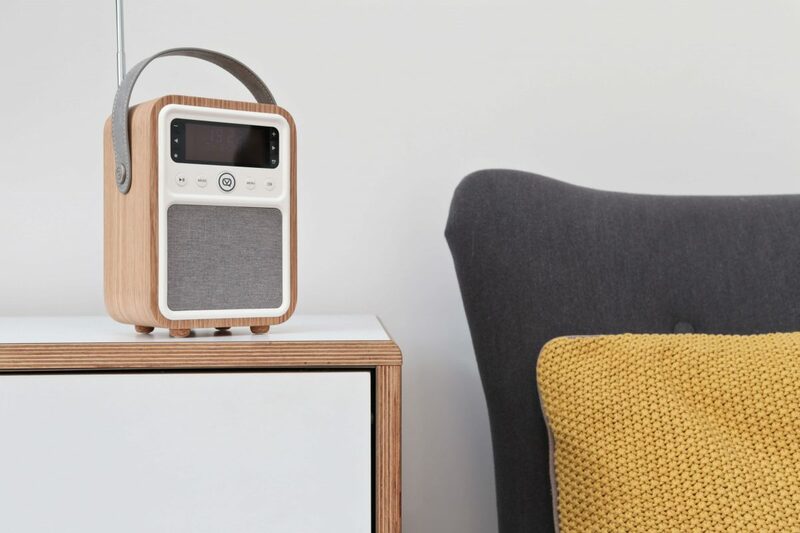 It’s time I introduced you to Monty, VQ’s gorgeous DAB digital radio with FM, Bluetooth and alarm clock. VQ Monty DAB Digital radio: First impressions. What can I say? 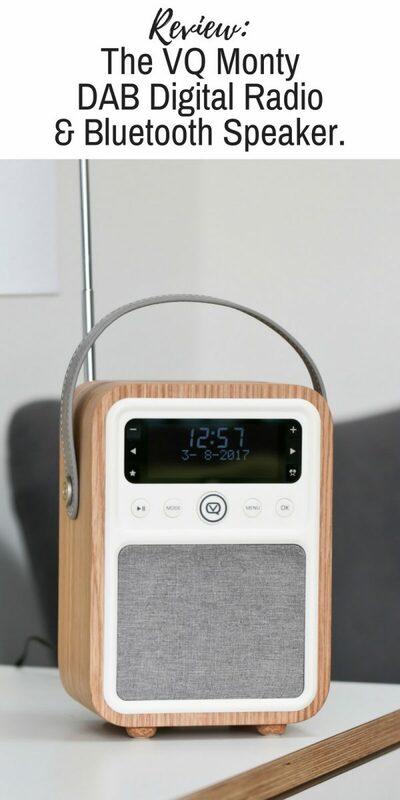 The Monty DAB/DAB+ Digital Radio (available in real oak or walnut casing) with FM, Bluetooth and alarm clock is a stunning little radio. 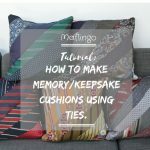 Often, when I’m searching for something to ‘fit’ my home or room, such as a piece of furniture, ornament, or accessory, I fear I won’t be able to find the perfect item, the one I imagine in my head. Amazingly, incredibly, the Monty in its real oak casing is perfect for our new extension. 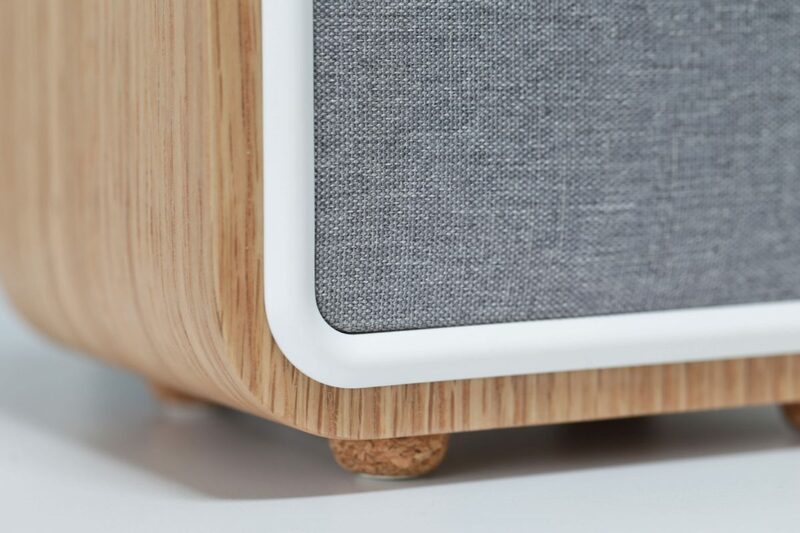 Not only does the real oak case and white face of the Monty radio match our Scandi style sideboard and dining table, the grey cloth speaker grille matches the cloth on our dining chairs, too! How cool is that? 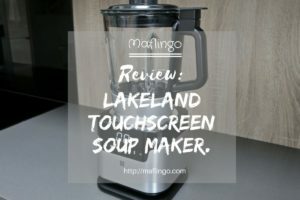 For the first time in a long time, I’ve found a product with looks and styling that surpass the one I imagined in my head. The thing that impresses me the most about the Monty’s design is the attention to detail and little touches. 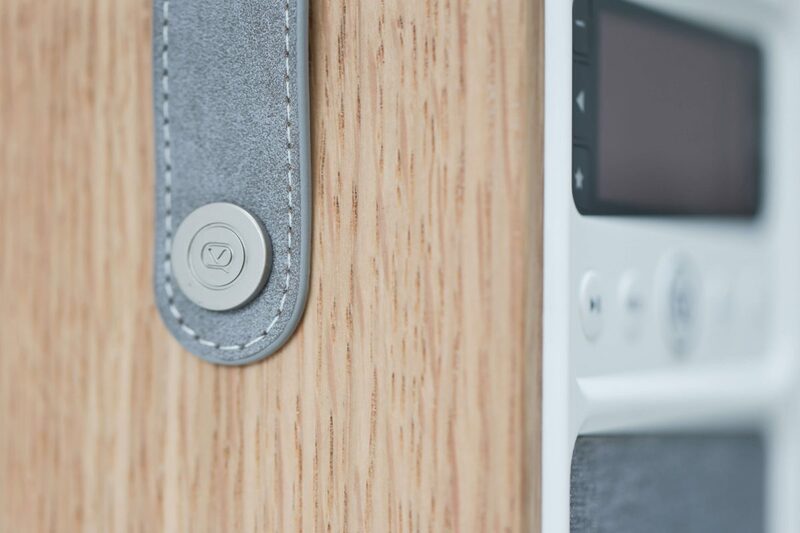 This is a radio that has been thoughtfully designed, from its little cork feet to the attractive grey fabric strap with its stylish fastening studs embossed with the VQ logo. The Monty may be small, but it’s packed with features and functionality. As well as a DAB/DAB+ digital radio, there’s an FM analogue radio option too. 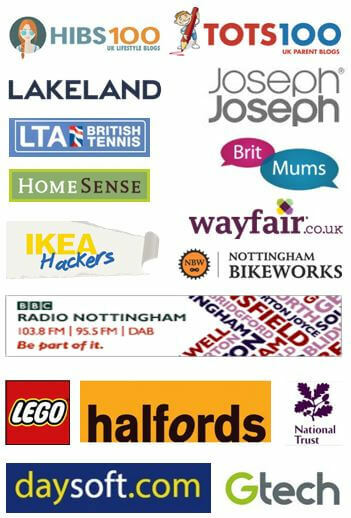 What’s more, as well as listening to all your favourite stations via DAB/DAB+ and FM, you can save them to one of the 30 preset channels, too. Being a fan of music streaming apps like Spotify, Bluetooth connectivity is a must-have feature for my perfect radio. The Monty offers Bluetooth wireless connectivity so I can listen to podcasts, online content or stream music via my smartphone or tablet. Better still, I can charge them using the integrated USB socket. Don’t be fooled by the Monty’s compact speaker, either. Powered by a 10W single ultra-wide speaker driver, it packs a punch that’s sure to fill any room in your home with crystal clear sound. Plus, with the inclusion of MyEQ, you also have control of bass and treble, either independently or via presets. 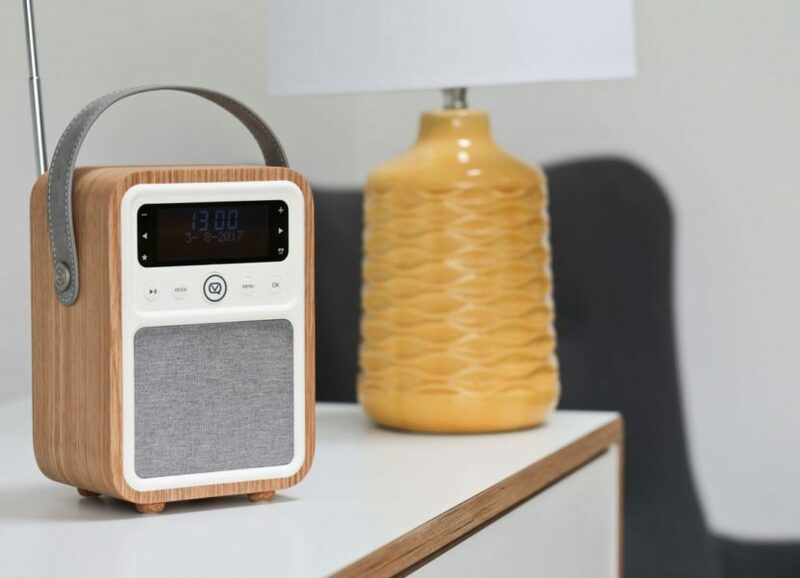 The Monty DAB digital radio is the perfect radio for the bedroom as well, with dual His and Hers/Week or Weekend alarms with snooze and sleep timer. If you like to take your music with you, either around the home or out to the park, you can also buy the optional VQ rechargeable battery pack, (£19.99 from the VQ website). 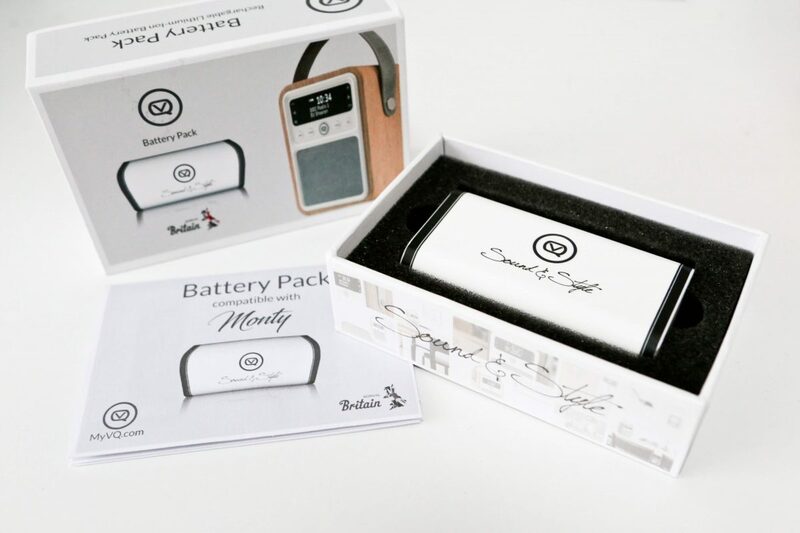 Like the Monty radio, the rechargeable battery pack is beautifully packaged. I really appreciate it when brands pay careful attention to the little details like package design, as well as the product itself. Does the Monty DAB digital radio’s Bluetooth function and sound quality match its good looks? When I first laid eyes on the Monty DAB digital radio, with its real oak casing, it was love at first sight. However, when it comes to choosing a radio, it doesn’t matter how swoonworthy its looks are if it’s a dud in terms of sound quality. Does the Monty, designed and engineered here in Britain, sound as good as it looks? The answer is ‘absolutely!’ I can’t believe how good this little radio sounds. Gone are the days where you had to adjust the dial on the radio like a professional safe cracker, to minimise the crackles and interference. This radio offers crystal clear sound on all the stations I tried. There’s no interference and no signal dropping. Crank the radio up to full volume and there’s no noticeable distortion, either. Instead, the full-bodied sound of Heart 80s (other stations are available) fills our large open plan extension. Connecting the iPod to the Monty via Bluetooth is a breeze. Simply select Bluetooth via the Mode button and then look for MONTY in the list of Bluetooth devices on your phone and select it. Mine paired quickly and easily without any issues, enabling me to listen to my favourite Spotify playlist, Hot Country. 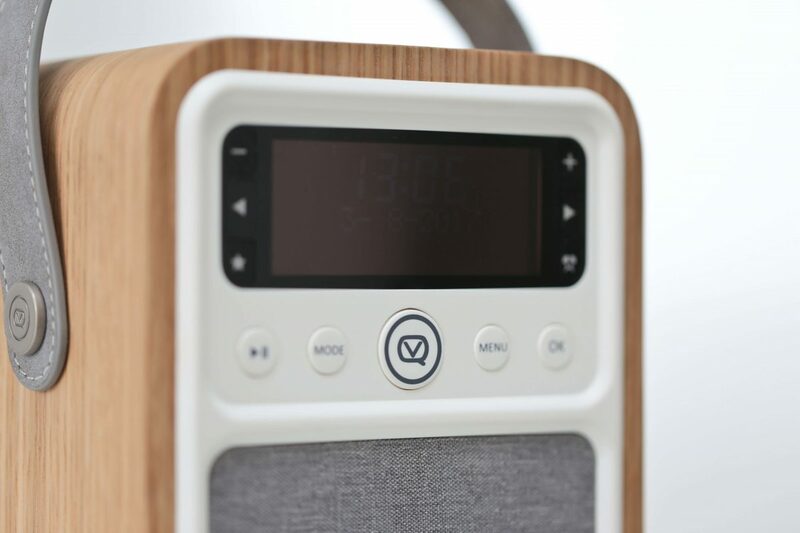 The VQ Monty DAB digital radio and Bluetooth speaker: The verdict. 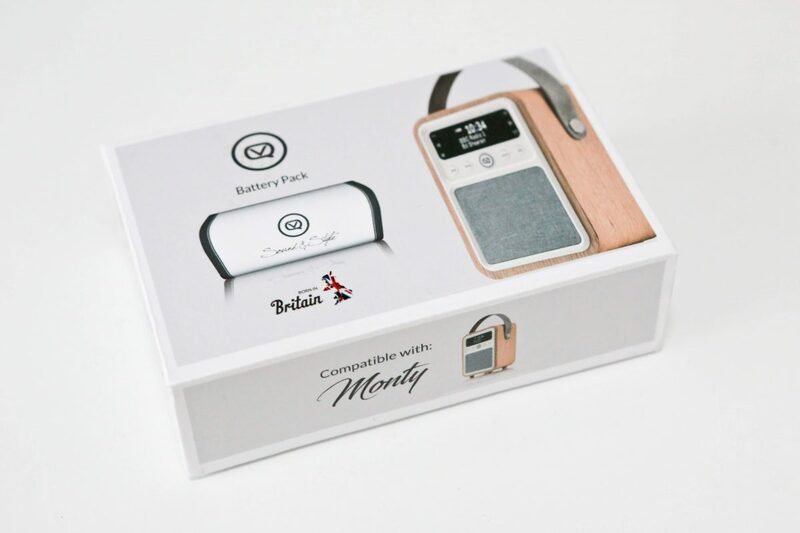 I’ve reviewed a number of products since starting my blog, but, hands-down, this small but perfectly formed Monty DAB digital radio is my absolute favourite. 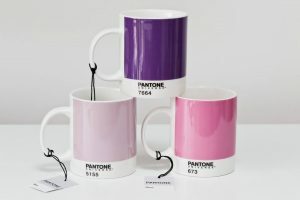 It’s made for our home in terms of its looks and styling. Better than that, this little beauty delivers crystal clear sound, whether I’m singing along to one of the dozens of DAB radio stations or streaming my favourite Spotify playlists from my smartphone via Bluetooth. Are there any shortcomings with the Monty? I only had a few minor issues with mine. A couple of the rubber studs that hide the screws attaching the cork feet to the radio worked themselves loose. Also, the end of the power cable that inserts into the power slot on the back of the radio doesn’t seem to push all the way in, leaving a little bit of metal showing. It still functions perfectly and isn’t loose – not sure if it’s an issue with mine or if it’s supposed to be like that, though. However, these are minor niggles, the Monty really is a beautifully made, impressive bit of kit. 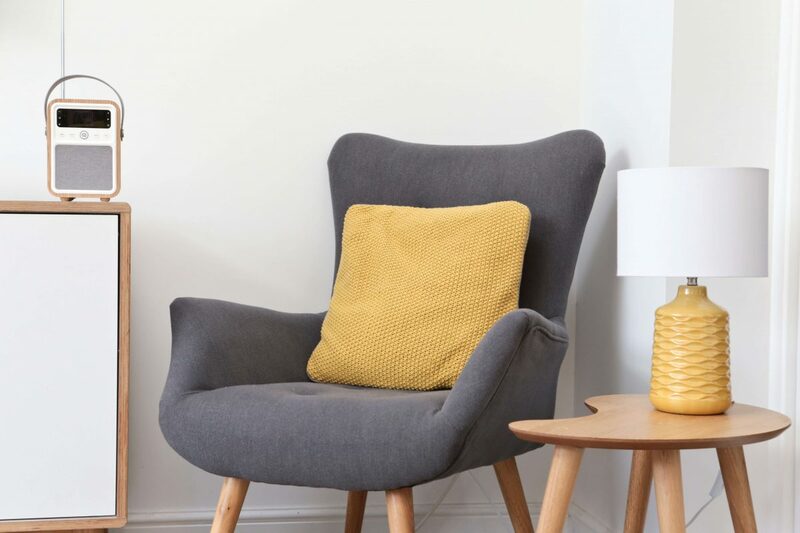 If you’re looking for a sleek, contemporary, feature-rich DAB digital radio that delivers great quality sound, you can’t go wrong with the Monty DAB digital radio and Bluetooth speaker. All you have to do is decide whether you want to offer Monty oak, or his handsome brother, Monty walnut, a place in your home. 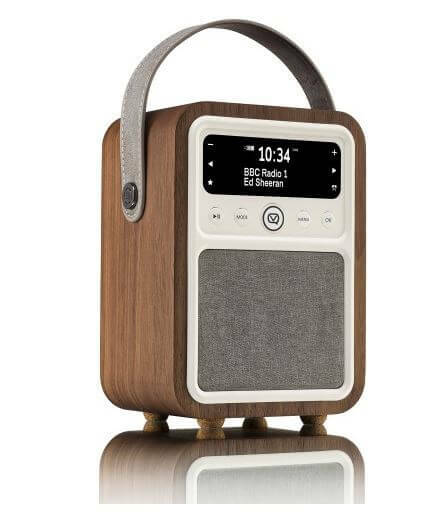 Win a VQ Monty DAB digital radio with FM, Bluetooth and alarm clock (choice of real oak or walnut) worth £99.99. Winner has choice of oak or walnut case. Image Source: VQ website. 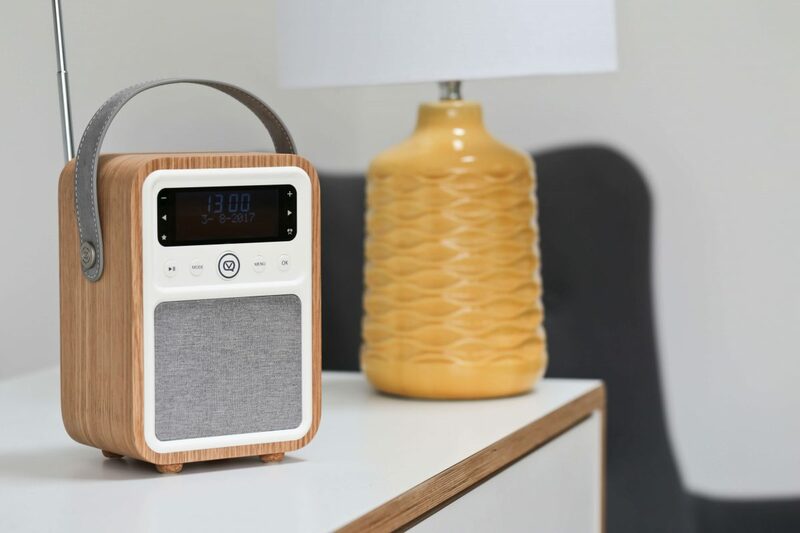 The lovely folks at VQ are offering one of my readers the chance to win a Monty DAB digital radio with FM, Bluetooth and alarm clock (Shown here in walnut). Even better, you can choose between the oak or walnut case. Please note: the radio comes with a mains adapter, the battery pack is sold separately. 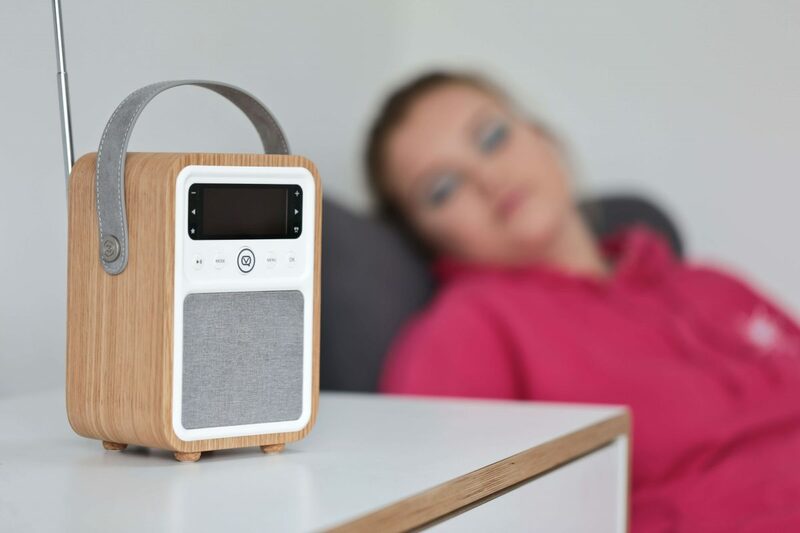 There is one prize of an exclusive VQ Monty DAB & DAB+ Digital Radio with FM, Bluetooth & Alarm Clock in a choice of oak or walnut for one winner. Up to 6 entries per person. All are compulsory methods of entry. Competition is closed to employees and relatives of Maflingo and VQ. Entries must be received by 11.59pm on 7th September 2017. The winners will be chosen at random and notified by email on 8th September 2017. If the winner does not respond within 7 days a new winner will be drawn. Maflingo reserves the right to amend or withdraw the competition at any time without notice or liability. To find out more about the VQ range of radios and speakers, Visit VQ : HERE. VQ kindly provided me with their Monty DAB digital Radio for the purposes of this review. As always, the views and opinions expressed here are my own honest assessment. I review 'Son of Steak', Nottingham. 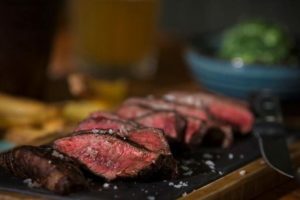 The new 'fast casual steak concept' promising steak lovers 'good food without the fuss, at an affordable price'. Kylie’s Spinning Around as it always makes me want to get up and dance! My favourite song is You were always on my mind by Willie Nelson because it is so romantic and lovely. Mine is The Power Of Love by Jennifer Rush. Metallica – Nothing Else Matters. 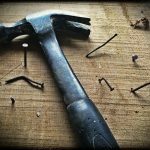 I adore Metallica anyway but this song contains valuable lessons – put yourself first! Breathe Easy by Blue has great lyrics and evokes good memories. In the Summertime by Thirsty Merc, as it reminds me of my year travelling in Australia. Wanted dead or alive by Bon Jovi, they are my favourite band and I have loved this song since I first heard it. My favourite song is “Eloise” by “The Damned”. I just love it. Mr Blue Sky by ELO, because I can sing along, I know all the words. It reminds me of summer and cheers me up. Foo Fighters – Pretender. It is just such a fantastic song, great drum beat & I really love playing it loud! Marvin Gaye – Sexual healing – First dance at my wedding – embarrassingly so! Snow Patrol – Chasing cars because it’s just got such beautiful lyrics and the tune is brilliant too. I love Tusk by Fleetwoon Mac as it reminds me of roadtrips with my mum. ‘Bring me to life’ by Evanescence ..there’s not a particular reason why this is my favourite song, but even since the first time I’ve heard it I seem to be wanting to play it/listen to it all the time! Stairway to Heaven by Led Zeppelin. I thought it was the perfect song when I first heard it as a teenager, and tens of years later, nothing has made me change my mind! Queen – Don’t Stop Me Now as it always lifts my mood. Celebration by Kool & The Gang. It takes me back to my Friday night’s out with the girls dancing at a nightclub in Cleethorpes. We went every week and always made sure we were up dancing for this one. Happy memories and a great song. Dry The Rain by The Beta Band, it’s so uplifting! My favourite song is ‘When You’re in love with a beautiful woman’ by Dr Hook, I have no idea why I have just loved it since I was a teenager! My favourite song is the planets bend between us, we had it as our first dance at our wedding. In My Life – The Beatles, because the words are profound and The Beatles are my fav! The End by The Doors just because it’s a musical and lyrical masterpiece! Don’t speak by No Doubt. Love it. The Sound of Silence – Simon and Garfunkel. It’s so poetic and deep. It sends shivers down my spine every time I hear it. I love wake me up before you go, go by wham because it reminds me of being a teenager. Atmosphere by Joy Division because it is hauntingly beautiful. Laura Mvula is an amazingly talented singer and songwriter. Every time I hear her songs or see a live performance, my mind and body become absolutely still. Her voice is just so powerful, the lyrics so brilliant, they reach in and through me and grab hold of every atom. The song “Overcome” from her most recent album The Dreaming Room is my current anthem; it gives me strength and reminds me that I have been brave when things were tough and can be so again. My absolute favourite is “Mr Blue Sky” by ELO,so uplifting and always helps me get through wiinter “sad” syndrome. Easy as sunday morning…It’s such a relaxing song which reminds me of holidays and quality time with the family. Forever Autumn by Justin Heyward from the album war of the worlds….because it is about renewed hope and we all need that! “An Eternal Flame” by the bangles. It reminds me of my teenage years. I love Al Green lets stay together its one of mine and my husband’s favourites. Bat out of Hell by Meatloaf its a great power ballad to sing along to and leaves you feeling great after you have belted out the lyrics. walking on sunshine, because it reminds me of my first holiday abroad, which was amazing, I always smile when I hear the song . Probably True colours by Cyndi Lauper, I was a huge fan as a child – first ever song I knew all the words to! Oo thats a hard one but in the end it’d have to be Taper Jean Girl by Kings Of Leon – it always gets me singing and dancing! Amazed by Lonestar is my favourite song because my husband and I walked down the aisle to it at our wedding. Break out by fairground attraction it reminds me of being pregnant with my first child, he was late being born, so we use to say this was his tune!! All along the Watchtower by Jimi Hendrix. Great tune which reminds of the good times of my teenage years. Billy Ocean – When The Going Gets Tough (The Tough Get Going) reminds me of being a child, I always recall hearing that song, fond memories! My favourite song is Goo Goo Dolls – Iris. It always makes me think of my Grandma, it’s such a beautiful song! Massive Attack – Unfinished Sympathy, its just the BEST SONG! Across The Universe by the Beatles, it was one of the first beatles songs I fell in love with. I also love Fiona Apple’s version of the song. 99 red balloons by Nena takes me instantly back to my days at college in the 80’s and the wonderful friends i made there. This song was always on the radio at that time. My favourite song is Gyptian – Hold You. Never fails to cheer me up! Reach for the stars!! Always gets me dancing ? I like Everybody, by Backstreet Boys, had such a great video with good themes, in which got me on the dance floor. I really love the song Happy by Pharrell Williams because not only does it make me feel happy, it reminds me of summer. Crocodile by XTC. It was the song I played over and over again as a child, and I still love it. californication i have always loved it. Motorcycle Emptiness by the Manics- they’re the band that got me into the music I love and that song reminds me of so many great times! 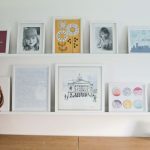 I have lots of favourites as they remind me of different times in my life. One song I love is REM’s Night Swimming. I also like Agnes Obel – Down By The River. Lighthouse Family High. It reminds me of fun road trips with my Mother. Bohemian Rhapsody – such a beautifully, dramatic song by Queen. Head like a hole! Nine inch nails! Reminds me of many a fun night out at uni! I also hum it to myself when I’m annoyed at work – gets me through ? It started with a kiss by Hot Chocolate, reminds me of a great affair! Bohemian rhapsody by Queen ! such an amazing song to sing along to! “I love to boogie” by T Rex – it is so very cheerful and always makes me want to dance. At The River by Groove Armada – reminds me of summer trips to the sea and has such a relaxed vibe! Bring Back Leroy Brown by Queen – it’s a great song that hardly anyone seems to know from them. 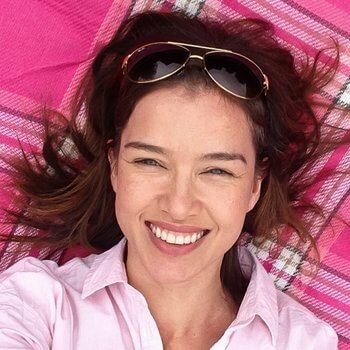 Mr Blue Sky – ELO the first song I heard after I found out I was pregnant with my little girl ! I love Careless Whisper and anything by George Michael ? Addicted by Enrique Igleseias – always gets me dancing! I love September by Earth, Wind and Fire. I really like Human by Rag n Bone man. His voice is so soulful I could listen to it all day. When it first came out i played it back to back for months, Still love it as much now as I did back then. Wow you’re right – the radio fits perfectly in your room. I looks like it was made for it! My fave song is probably Thank You by Led Zepplin. I danced around my besties living room in the wee hours to this song for many many years and it’s definitely our song. Do you really want to hurt me. Culture Club. The first single i ever spent my pocket money on. Aw, it’s funny how songs can evoke such strong memories and emotions. Its Thunder – When Love Walked In – When i met my husband ( on the net ) we spoke for ages before we met up and talked about his favourite band ..Thunder. I had never heard of them but when we actually met up the first thing he did was give me a Thunder CD – i actually walked down the aisle to WLWI it was perfect and will always be our song. OOoh, that’s a lovely story and I’ve never heard that song…I’m sure a spotted a Thunder cassette in the loft belonging to my husband. though! Will check it out. Its always something else until I suddenly hear Bette Davis Eyes come on the radio and I remember how much I love it . My favourite song is Queen – You’re My Best Friend because it brings back so many memories of my best friend, who introduced me to it! I love Dreams by Fleetwood Mac – Stevie Nicks voice is amazing on it. I love Lisa Stansfields – The Real Thing. The words mean a lot to me and reflect parts of my life. Space Oddity by David Bowie just because it’s awesome! ‘Wonderful Tonight’ by Eric Clapton was always our song from when we first me 25 years ago! “I can’t fight this feeling”. It reminds me of high school and having loads of fun. My favourite song is Enter Shikari – Live outside, such a great song! Brad Paisley – Sothern Comfort Zone because the lyrics mean a lot to me. Sowing The Seeds of Love – Tears For Fears – to be fair I like all music by them. I’m loving the Latin American music around at the moment, especially Mi Gente, as it reminds me of backpacking in South America many years ago. Simple Minds – Don’t You (Forget About Me). From the classic film Breakfast Club which I identified with so much as a kid. If I have to pick one, it would be Paradise City by Guns N’ Roses. Mostly because it reminds me of my childhood. You Might As Well Smile by Glen Campbell. I love just about everything by Glen but the lyrics in this beautiful song are particularly poignant following his recent death. Tough question! It seems to change all the time but at the moment my favourite is Good Riddance by Green Day – heard it the other day and it very much reminds me of the halcyon days of my youth! Fast Car by Tracey Chapman. Its so beautifully written! My favourite song is What a Wonderful World – Louis Armstrong. The words should always remind us to appreciate nature’s beauty, our friends & family & care about the world we all share. Billie Jean, Michael Jackson because it’s a great song. My favourite is I don’t feel like dancing by the Scissor Sisters. But I always do! The account for MyVQ on twitter has been suspended! Perhaps overload of likers? Happy by Pharell Williams always puts a spring in my step ?